Ogden mourns by covering itself infavorite color of one of the victims of Connecticut's school massacre. 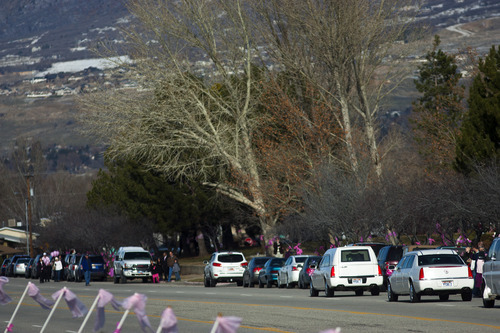 Scott Sommerdorf | The Salt Lake Tribune Valerie Young and her six year-old daughter Annabelle tie pink ribbons along the route on Monroe Blvd. that leads to Evergreen Memorial Park, Saturday, December 22, 2012. Leah Hogsten | The Salt Lake Tribune Friends and family walk to the Rock Cliff LDS Stake Center Saturday December 22, 2012 in Ogden. Funeral services for Connecticut elementary shooting victim Emilie Parker were held in Ogden at the at the Rock Cliff LDS Stake Center. Emilie, whose family has Ogden roots, was one of 20 children and six adult victims killed in the Dec. 14 mass shooting at Sandy Hook Elementary in Newtown, Conn. The shooting took the lives of 26 people, before the gunman killed himself. Chris Detrick | The Salt Lake Tribune Supporters on the sidewalk along Monroe Blvd, as they wait for Emilie Parker's hearse to pass on the way to Myers Evergreen Memorial Park Saturday December 22, 2012. Emilie Parker, 6, was one of 20 children massacred by a gunman Dec. 14 at Sandy Hook Elementary School in Newtown, Conn. Chris Detrick | The Salt Lake Tribune Supporters on the sidewalk along Monroe Blvd, as they wait for Emilie Parker's hearse to pass on the way to Myers Evergreen Memorial Park Saturday December 22, 2012. 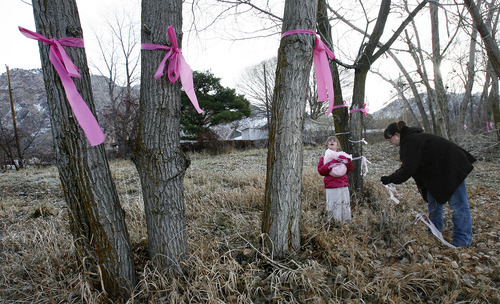 Emilie Parker, 6, was one of 20 children massacred by a gunman Dec. 14 at Sandy Hook Elementary School in Newtown, Conn. Scott Sommerdorf | The Salt Lake Tribune Valerie Young and her six year-old daughter Annabelle tie pink ribbons along the route on Monroe Blvd. that leads to Evergreen Memorial Park, Saturday, December 22, 2012. Leah Hogsten | The Salt Lake Tribune Robbie Parker carries daughter Madeline, 4, and Alissa Parker carries Samantha, 3, from the funeral service for their oldest daughter Emilie, Saturday December 22, 2012 in Ogden. Funeral services for Connecticut elementary shooting victim Emilie Parker were held in Ogden at the at the Rock Cliff LDS Stake Center. Emilie, whose family has Ogden roots, was one of 20 children and six adult victims killed in the Dec. 14 mass shooting at Sandy Hook Elementary in Newtown, Conn. The shooting took the lives of 26 people, before the gunman killed himself. Leah Hogsten | The Salt Lake Tribune Saturday December 22, 2012 in Ogden. Funeral services for Connecticut elementary shooting victim Emilie Parker were held in Ogden at the at the Rock Cliff LDS Stake Center. Emilie, whose family has Ogden roots, was one of 20 children and six adult victims killed in the Dec. 14 mass shooting at Sandy Hook Elementary in Newtown, Conn. The shooting took the lives of 26 people, before the gunman killed himself. Leah Hogsten | The Salt Lake Tribune Saturday December 22, 2012 in Ogden. 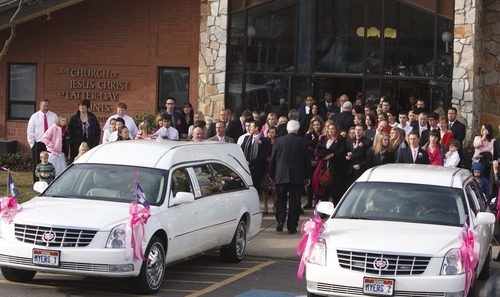 Funeral services for Connecticut elementary shooting victim Emilie Parker were held in Ogden at the at the Rock Cliff LDS Stake Center. Emilie, whose family has Ogden roots, was one of 20 children and six adult victims killed in the Dec. 14 mass shooting at Sandy Hook Elementary in Newtown, Conn. The shooting took the lives of 26 people, before the gunman killed himself. 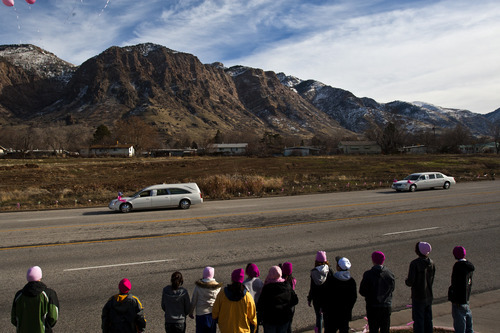 Chris Detrick | The Salt Lake Tribune Supporters on the sidewalk along Monroe Blvd, as they wait for Emilie Parker's hearse to pass on the way to Myers Evergreen Memorial Park Saturday December 22, 2012. 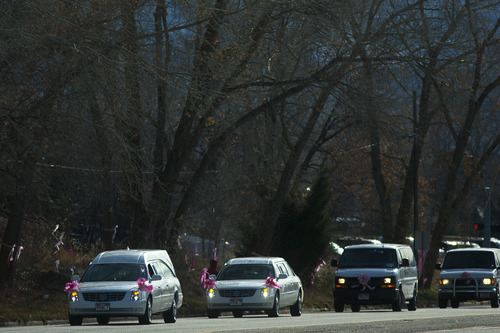 Emilie Parker, 6, was one of 20 children massacred by a gunman Dec. 14 at Sandy Hook Elementary School in Newtown, Conn. Chris Detrick | The Salt Lake Tribune Emilie Parker's hearse drives along Monroe Blvd to Myers Evergreen Memorial Park Saturday December 22, 2012. 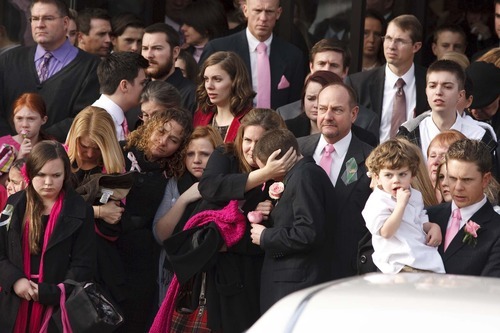 Emilie Parker, 6, was one of 20 children massacred by a gunman Dec. 14 at Sandy Hook Elementary School in Newtown, Conn. Chris Detrick | The Salt Lake Tribune Emilie Parker's hearse drives along Monroe Blvd to Myers Evergreen Memorial Park Saturday December 22, 2012. 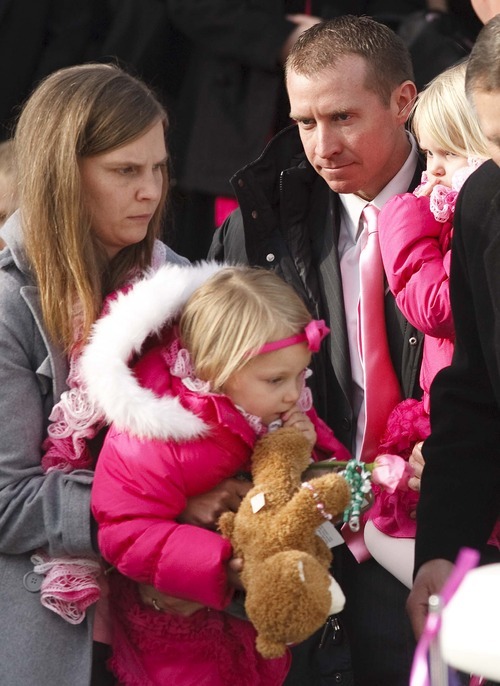 Emilie Parker, 6, was one of 20 children massacred by a gunman Dec. 14 at Sandy Hook Elementary School in Newtown, Conn. Chris Detrick | The Salt Lake Tribune High School students from around Davis County release pink balloons on the sidewalk along Monroe Blvd, as Emilie Parker's hearse passes on the way to Myers Evergreen Memorial Park Saturday December 22, 2012. 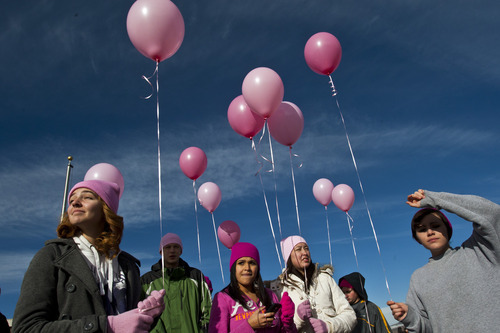 Emilie Parker, 6, was one of 20 children massacred by a gunman Dec. 14 at Sandy Hook Elementary School in Newtown, Conn. Chris Detrick | The Salt Lake Tribune High School students from around Davis County hold pink balloons on the sidewalk along Monroe Blvd, as they wait for Emilie Parker's hearse to pass on the way to Myers Evergreen Memorial Park Saturday December 22, 2012. 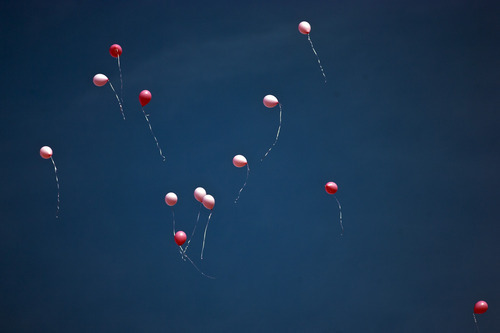 Emilie Parker, 6, was one of 20 children massacred by a gunman Dec. 14 at Sandy Hook Elementary School in Newtown, Conn. Chris Detrick | The Salt Lake Tribune Sadee Fain, 16, Carmen Morales, 17, Erin O'Connell, 17, and Shawnee Sanders, 16, hold pink balloons on the sidewalk along Monroe Blvd, as they wait for Emilie Parker's hearse to pass on the way to Myers Evergreen Memorial Park Saturday December 22, 2012. 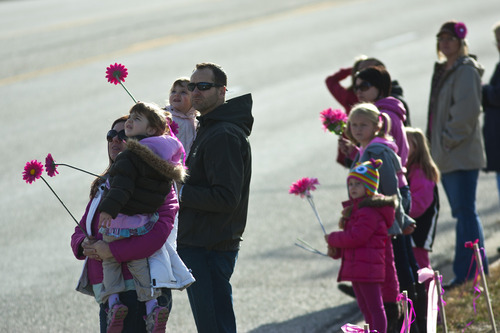 Emilie Parker, 6, was one of 20 children massacred by a gunman Dec. 14 at Sandy Hook Elementary School in Newtown, Conn. Chris Detrick | The Salt Lake Tribune High School students from around Davis County release pink balloons on the sidewalk along Monroe Blvd, as Emilie Parker's hearse passes on the way to Myers Evergreen Memorial Park Saturday December 22, 2012. Emilie Parker, 6, was one of 20 children massacred by a gunman Dec. 14 at Sandy Hook Elementary School in Newtown, Conn.
Ogden • The shoulders that once carried his daughter high in the air slumped deep at the podium  the weight of despair too heavy a load for them to bear. Robbie Parker took a few moments to compose himself. A crowd of about 800, sniffling through silence, watched the father of Emilie Parker look at the tiny white casket and press through memories of his 6-year-old daughter during her funeral Saturday. He remembered how she took care of her younger sisters, Madeline and Samantha  how, when he would be cooking in the kitchen, Emilie would comfort her crying siblings by hugging them so he could finish getting their dinner ready. "Emilie lightened our burdens," Parker said. "Even when Emilie was very young, she always helped." Her funeral was among the last of the 20 children gunned down at Sandy Hook Elementary in Newtown, Conn., more than a week ago. She is the only one of the young victims to be buried outside of the New England area. That&apos;s because Robbie Parker and his wife, Alissa, have deep roots in Utah. 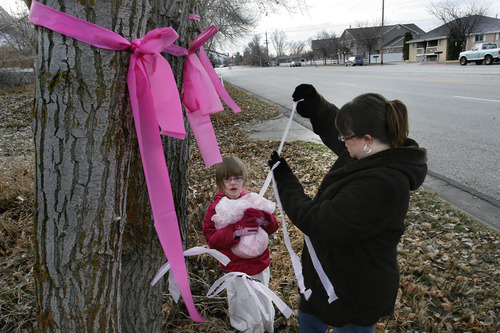 The outpouring of grief has been apparent all week as Ogden residents tied pink ribbons on trees, signs, utility poles. 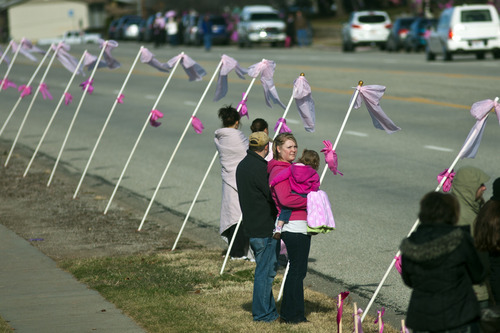 The route from the funeral at a Mormon church to the grave site was hued in pink  Emilie&apos;s favorite color  as residents lined Monroe Boulevard. 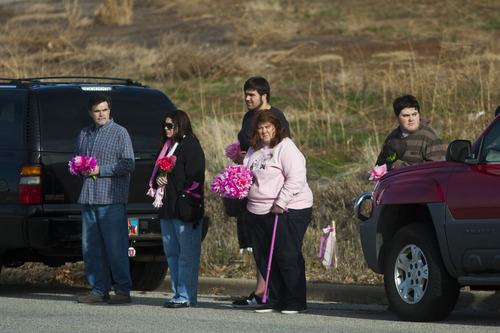 The public memorial at Ben Lomond High on Thursday night drew several hundred people sporting pink and green ribbons. At Saturday&apos;s funeral, Utah Gov. Gary Herbert came. So did Mormon apostle Quentin L. Cook. "This state mourns for you and your loss," Herbert said. "The best way we can remember Emilie is by improving our own lives, having the same kind of faith and innocence that comes with the little children." Sisterly love • The cold air chilled the Parker family members as the coffin was carried by eight pallbearers and laid in front of them at Evergreen Memorial Park  right next to Alissa&apos;s father, who died in a freak bicycle accident in September. Robbie Parker held Madeline Parker, 4, while Jill Garrett, Alissa&apos;s sister, held Samantha Parker, 3. 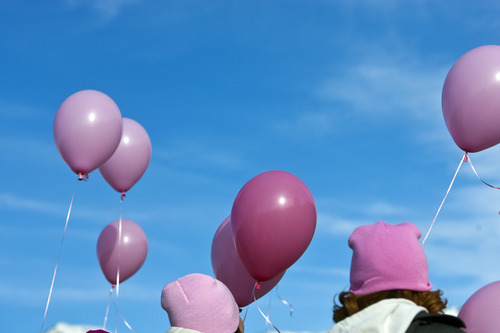 Both children were bundled up in pink jackets and Madeline clutched a new teddy bear she has named after her big sister. Alissa Parker looked down, arms folded and closed her eyes during the short benediction. Brady Cottle, her brother, said the week has been hard for her. "She&apos;ll see a doll or a present that was Emilie&apos;s," he said, "and she&apos;ll lose it." But death couldn&apos;t stop the kids from being kids. Samantha Parker wandered curiously around the casket and was finally lifted up by Garrett.The little girl placed her tiny hand on the surface  the closest she could get to her sister  and leaned down to give it a kiss. As the graveside service ended and Robbie Parker greeted mourners with hugs, Madeline Parker had wandered over to a grassy area and saw 2-year-old Eleanor Idone crying over some spilled Cheerios she&apos;d been snacking on. The young girl, with the teddy bear in one hand and a pink flower in the other, approached the troubled tot and tapped her on the shoulder. Eleanor looked up and Madeline handed her the flower, as Eleanor returned a smile. Vinny Idone, her father from New York who had befriended the Parkers when they moved to Connecticut about eight months ago, grinned and said it&apos;s exactly what Emilie would&apos;ve done. After giving the young girl the flower, Madeline headed to a warm van. But a worried Samantha wandered through the thicket of adult legs. "Madeline, Madeline," she said in a tiny voice. "Madeline." She was led to the van, where her sister was. Madeline gave her a hug. She would have to be the older sister now. Sweet, talker • Robbie Parker was never shy. After the shooting, he was among the first parents to speak out publicly  something that shocked almost no one who knew them. It was clear Emilie inherited that gene. "Emilie was an amazing communicator," Parker said. "By the time she was 18 months, she was speaking in full sentences. She didn&apos;t have teeth yet, but she was speaking in full sentences. I think you can argue that in her six years in life she was able to get in a lifetime of talking." When she wasn&apos;t talking, she was drawing. Robbie Parker said giving her a notebook was "like giving a kid candy." Emilie, who was born in Ogden, was also a particular artist  not wanting to draw on the back of a page on which she had already drawn. He said she thought it would ruin the picture. Her art was on display leading into the church  framed pieces of a princess in pink, a colorful pig and a book she had stapled together that was titled "My Flying Dog Marbel," featuring the adventures of a long, brown dog with floppy black ears. But as much as she loved dogs  including uncle James Parker&apos;s duo, Luke and Jack, the sensitive Emilie never asked for pets because her mother was allergic to animals. Her uncle said this week that she was always careful to wash her hands after touching the dogs to keep Alissa from having a reaction. Caleb Garrett, her oldest cousin, said Emilie always thought of others. He remembered how she had asked him to draw a dog, but she said she&apos;d only draw one if he did so as well. When the dogs were completed, she studied his work. "We looked at my drawing and she said, &apos;Caleb, yours is so much better than mine.&apos; " he recalled. "I looked at Emilie and said, &apos;No, Emilie, yours is way better than mine. She just looked at me and said in the sweetest voice, &apos;Thanks.&apos; "
He said he remembered how she made the world feel like "a wonderful, special place." As the Parker family left the church, the two sisters headed to the van together. Robbie Parker walked, his shoulders slumped for a moment.